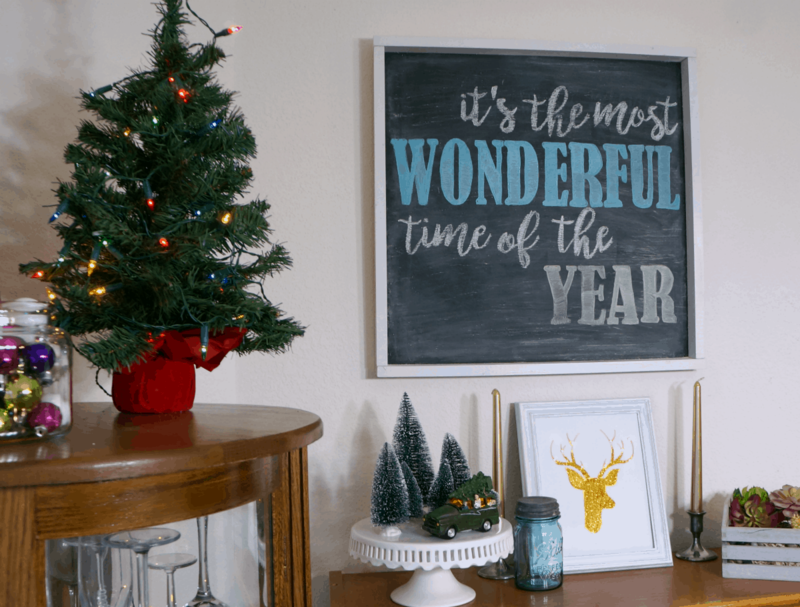 Twinkling lights, colorful decorations and lots of glitter characterize my Christmas decor this year. I am so excited to move from neutral and classic red to vibrant and fun colors throughout my house. 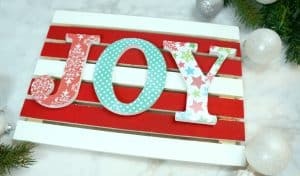 I am reusing many of the decorations I already have but mixing them with new and colorful DIY pieces. Today I’m sharing this Christmas reindeer art with lights. It has the pretty twinkling lights, sparkly gold glitter and the best part is I made it from a thrift store frame. 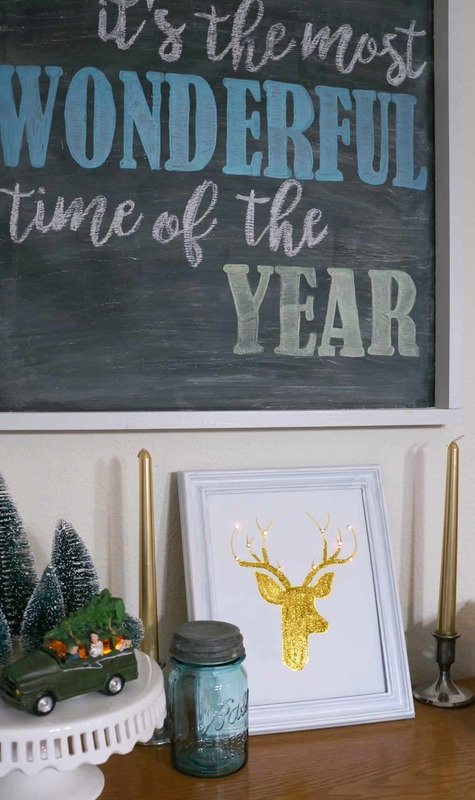 This reindeer art is in my kitchen under a colorful chalkboard among some cute holiday decor. At night it brings a little sparkle to a dim room and even in the daylight hours the glitter shines. Here is what I used to make this Christmas reindeer art, some of these are affiliate links you can view my full disclosure policy here. I removed the glass from the frame and painted it white. Then I cut a piece of cardboard to fit inside the frame and discarded the back. 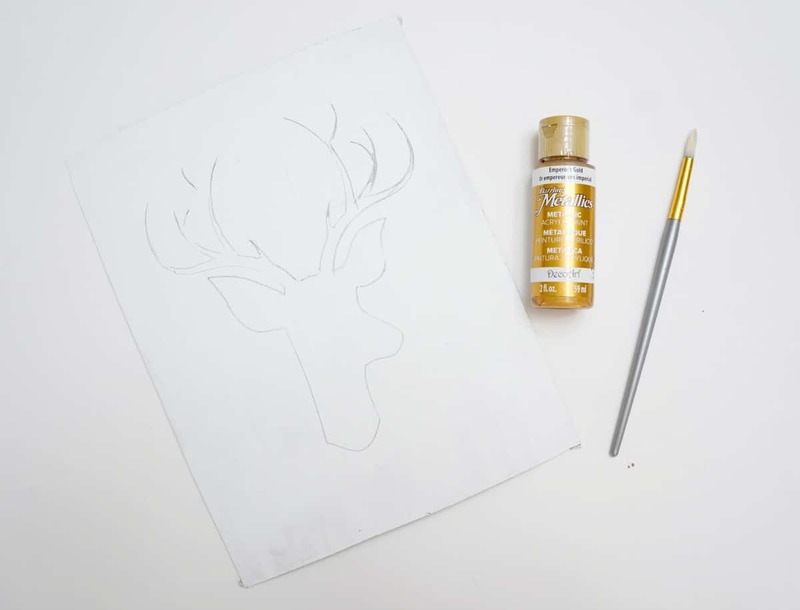 I painted the cardboard white and, once dry, traced a reindeer onto it. I used a reindeer head from PicMonkey and cut it using my Silhouette. 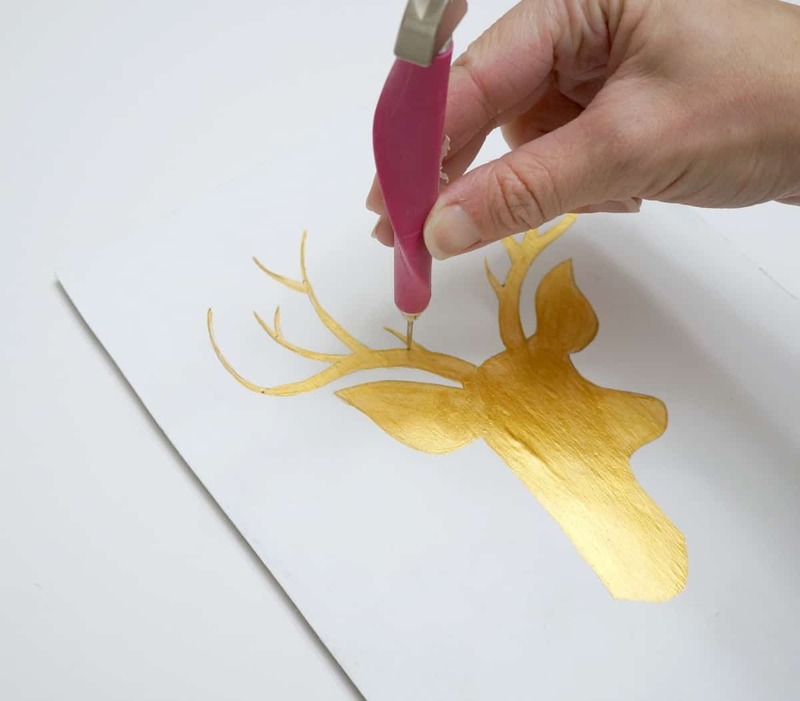 I painted the reindeer gold and let that dry completely. This piercing tool comes in handy in my craft room. 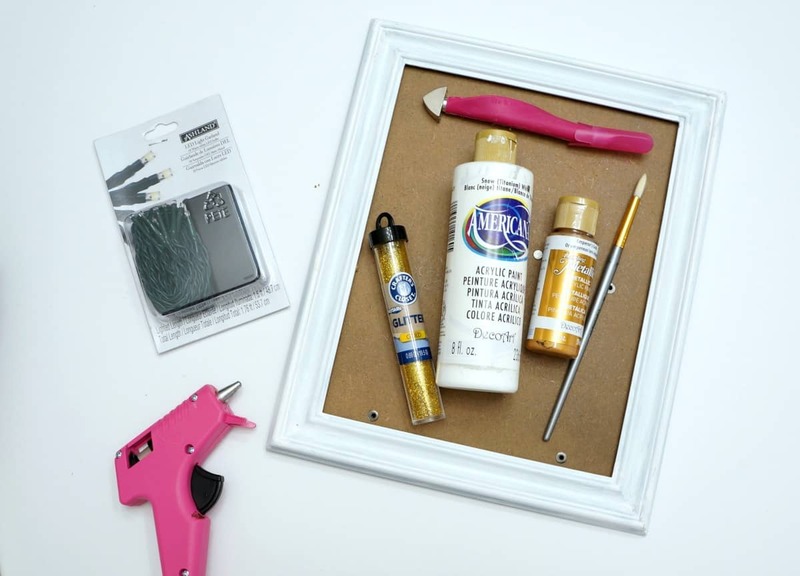 I use it primarily for brads to embellish paper crafts but it works perfectly for a project like this to pierce holes in the cardboard. From the back of the cardboard, I pushed each LED light through a hole then added a bit of hot glue to hold them in place. 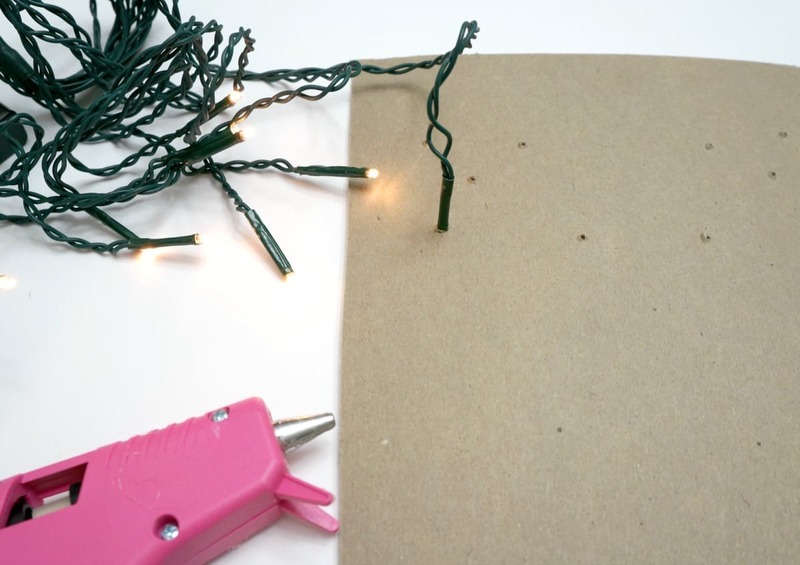 These lights are battery powered and the cord is easily hidden behind the frame. 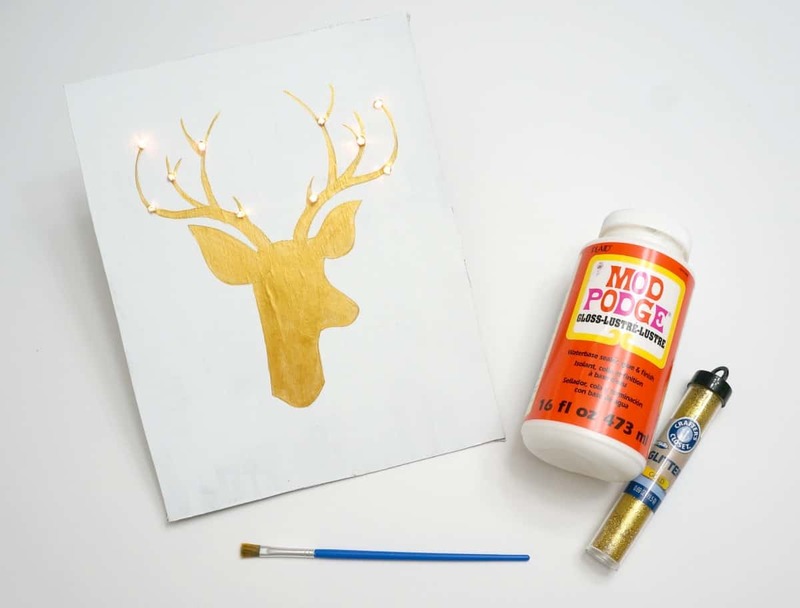 Once the lights were secure I brushed Mod Podge onto the head of the reindeer and added gold glitter. I waited until the end so I didn’t make a sparkly mess attaching the lights. 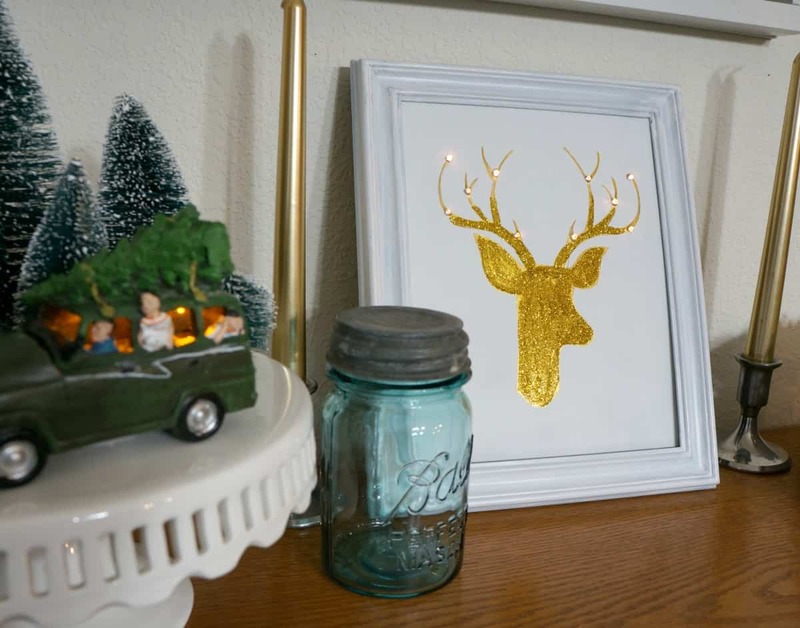 This Christmas reindeer art is another DIY craft I made this year to brighten up my holiday decor. I am still using my silver and neutral pieces from years past but these fun pops of color and sparkle create a whole new look. 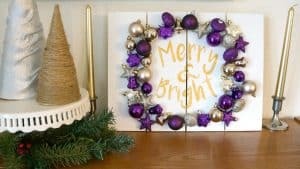 I recently shared my colorful Christmas mantle on Instagram, be sure to follow me for peeks into my home and correct craft projects. this is super cute! I’d love to make one. I love the lights! Thanks so much for sharing!